Instructions: Card size: 6 3/4 x 5". Cut a piece of blue plaid decorative paper to fit front of card. Use the curved pocket from the flipfold insert pack and cut it down to a height of 3 1/4" on the high side. Cut a white decorative border from the Elegant Borders. Cut a piece of yellow print from the decorative paper to fit the front of the pocket then glue it to the front and the border to the back of the pocket. Cut a rectangle of the same yellow paper 6 1/4 x at least 4" then use one of the rectangle dies from the Eyelet Rectangles to cut away the center, leaving a frame. Glue it to the front of the card and then glue the pocket to the front using the tabs on the sides. Add a dot of glue at the bottom to keep note card from slipping through. Die cut 8 corners from Album Tags and Accents out of white. Glue 2 of them to the top. Stamp, sponge color and die cut 3 colors of flowers (small), pour Crystal Lacquer over the middle and let dry. Stamp, die cut and color the birthday wishes banner (also cut one from foam sheet, let sit over-night to regain its original shape and size). 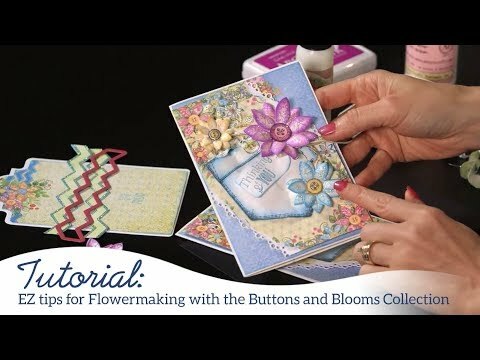 Glue the colored image to the foam sheet layer and then add enamel dots to centers of flowers. Stamp and die cut purple buttons and sponge color then add Crystal Lacquer and let dry. Later, pierce holes and thread with embroidery floss. Add buttons to 4 corners of pocket, 3 flowers to the right side and the birthday wishes to the left side of pocket. Front is finished. Note card for the front pocket size: 4 1/4 x 5 1/2". Leave the back of the note card/tag blank to write a personal note. Cut a piece of quilted patchwork paper 4 1/8 x 5 3/8" and glue to the card/tag. Cut a white panel 4 3/4 x 3 1/2" then run it through the die cutting machine in an embossing folder. Glue it to the center and then make a thin frame with the rectangles from Hand-stitched Accent die, use the yellow print paper. Glue 4 white corners to the tag. Cut 2 tags from decorative paper using Tickets and tags and the Album Tags dies, glue them together and cut 2 lavender hole re-enforcers for each side. Add a lavender brad to each hole and purple floss to one side. Sponge adhesive over flowers on tag and sprinkle with glitter. Stamp quilt pieces using Tiger Lily, Sunflower, Magenta Hue, and Leaf Green. Arrange pieces over white embossed panel and glue down then glue die cut tags over the top. Note card/tag is finished, insert it into the curved pocket on the front of card. Inside of card: Cut a piece of yellow print 6 1/2 x 4 3/4" and glue to the inside. Cut a strip of quilted decorative paper and glue to the top leaving a 1/4" yellow border. Make the short pocket from the flipfold inserts and cover with a piece of decorative paper 1 3/4 x 6". Glue 2 white corners to the bottom corners of pocket and glue tabs to card inside toward the bottom leaving 1/4" yellow border at the bottom. This pocket can be used for money or gift card. Add a button to the center of pocket. Cut out the "A Gift For You" tag from white and from decorative paper then glue to the center top of inside. Cut out another small tag from decorative paper, use another lavender hole re-enforcer and more purple floss to finish the tag. Glue it to the left side of "A Gift For You" to finish card.